W pierwszych latach życia często dopadają nas tzw. choroby wieku dziecięcego, które choć niemiłe, bywają nieuchronne. Poniżej najpopularniejsze choroby dziecięce wraz z szeregiem charakterystycznych symptomów i przykładowymi zdaniami gotowymi do użycia w dialogach rodzic-dziecko. 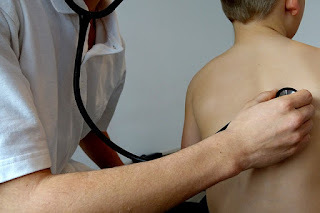 croup - krup → A swelling of the windpipe, airways to lungs and the vocal cords. Poor you, this barking cough is so persistent. I can hear a harsh sound when you breath in. whooping cough (pertussis) - krztusiec → Persistent dry and irritating cough, a runny nose, high temperature, vomiting after coughing. Those intense bouts of coughing must be very tiresome. Time to drink your cough syrop. asthma - astma → A long-lasting respiratory condition, chest tightness, breathlessness. Thanks to the inhaler you can breath more easily. Use the inhaler each time you have problems with breathing. Take it with you everywhere. bronchitis - zapalenie oskrzeli → The inflammation of airways in the lungs. pneumonia - zapalenie płuc → An infection of the lungs caused by bacteria, viruses or fungi. Do you feel tired and unwell? Are you sweating or shivering? It seemed you were recovering from cold but then it got much worse. It might be pneumonia! cold - przeziębienie → Coughing, sneezing, sore throat, blocked or runny nose, fever. Let's relieve your stuffy nose with some saline nose drops. Have you got enough tissues to empty your nose? flu (influenza) - grypa → Cold sympthoms + muscle aches. Sometimes affecting the lungs. Can you feel your muscles? Are your eyes sore? We can apply the eye drops to ease the pain. fever - gorączka → Temperature over 38°C. Your body is fighting an infection now. Your face feels hot to touch. You look red / flushed. Let's check your temperature with a thermometer. You might have chills /shivering because your temperature is rising again. You're sweating because your temperature is falling. Drink water, we don't want you to become dehydrated. ear infection - infekcja ucha → Earache, usually appears after a cold. Please don't pull your ear, the medicine should start working in a moment. You're rubbing at your ear again. Do you feel the pain in your ear again? Let's put some ear drops to your ear to unblock it. glue ear - wysiękowe zapalenie ucha środkowego → When sticky fluid builds up in the ear and affects the sense of hearing. Do you hear properly? Or have you got problems with hearing? The antibiotics will help us get rid of this pain in your ear. tonsilitis - angina (zapalenie migdałków) → The inflammation of the tonsils which are red, swollen and painful, sometimes with white patches. Is it diffucult to swallow your food? Your tonsils are still swollen and sore, poor you. Mommy will give you some medicine to reduce discomfort. You need to rest a lot. Would you like some ice-cream to soothe your sore throat? food poisoning - zatrucie pokarmowe → The stomach is upset. There are abdominal cramps with flu-like symptoms, diarrhoea or vomiting. Have you got a pain in the lower part of your tummy? vomiting - wymioty → Disgorging the stomach contents, throwing up. Do you feel nauseous / queasy? Please drink more water. You're not peeling enough. diarrhoea - biegunka → The poo is frequent, runny and watery. Look, the doctor has prescribed anti-diarrhoeal drugs. You'll soon feel better. Take this medicine / pill and drink lots of water after swallowing it. Let's spread some barrier cream on your bottom to prevent nappy rash. food allergies - alergie pokarmowe → Hives, swelling of the face, sometimes troubles in breathing and tightness in the throat. Please, remember not to eat ... because you have an allergy to it! You might be drooling because you can't swallow. Are your tongue and throat itchy? chickenpox - ospa wietrzna → A rash of red, itch spots which then turn into fluid-filled blisters. Remember not to scratch the spots because it can lead to scars. I'll spread a cooling gel on your itchy spots, it should ease the itching. You have a rash all over your body. Let's rub the medicine in your back. Those blisters will dry up soon and form scabs. Let's wait for the scabs to drop off. measles - odra → Fever, cough, sore and watery eyes + a rash with red, slightly raised spots. Please, cover your mouth while sneezing, we don't want to spread the virus. The rash spots might be blotchy but not itchy. You're ill. You have to stay in bed until you feel better. German measles (rubella) - różyczka → Pink skin rash, swollen glands, fever, runny nose and headache. Honey, at least you will develop a long-lasting immunity against this disease. You can have German Measles only once in your life. mumps - świnka → Painful swellings at the sides of the face under the ears, "hamster face" look, high temperature, headache, joint pain. I'll put my hand on your forehead to check if you have temperature. Lie down, mommy will bring your favourite book. prickly heat (heat rash) - potówki → Sweat becomes trapped under the skin. Let's rub some ointment to get rid of your heat rash. You must have been to hot. Let's take some clothes off. It must be to hot for you in here. It must be itchy but please remember not to scratch it. constipation - zaparcia → Difficulties in expelling. Have you got problems with doing poo? You need more fiber. Which fruit or vegetable would you like to eat now? It's normal to be constipated while travelling. Zerknijcie też na Angielskie piosenki o przeziębieniu, czyli jak rozweselić rozchorowane szkraby.